King Rupert is a platformer game that follows the aging royal on his quest for Wizzie, an insolent and grumpy wizard who dislikes the beloved king. The game was released by UAB Lucky Loot for an iPhone, iPod Touch, and iPad, and it costs $0.99. There is a lite version offered as a free trial for anyone who is interested. 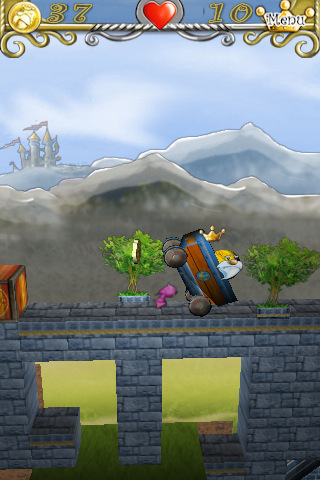 In this game, Wizzie has turned King Rupert into a ball and scattered his “character and body” all over the kingdom in the shape of copper, gold and silver coins. Even though the ball is basically a head with a crown sitting on top of it, nobody recognized the king and he was thrown out of his own castle. It is up to you to control the rolling head on its quest to grab as many coins as possible for the point of total restoration. There are many obstacles set in place to prevent the king’s return to greatness. To move forward or backward you tilt your device right and left, respectively, and to jump you tap the screen. For high jumps you simply hold your finger on the screen longer. It is really tough to control the ball at first. The coordination of tilting and tapping is harder than it seems. As you rise through the levels the challenges intensify. Balls of fire, bats, intricate mazes, and spoked wheels are the least of your worries as you jump and dodge your way to the next level with as many coins as you can find. One of the biggest challenges is finding your way to the next level. There are so many twists and turns that you can get lost easily. The platforms also make it tough because once your balls slides off the tiny space you tumble down to where you were 5 minutes ago. There are 30 levels to beat so you have some time to spend with the game before you are through. Be warned: This game is highly addictive. I could not tear myself away from it. Maybe it is only because I have not played a platformer game in a long time, but I found King Rupert to be a total blast. 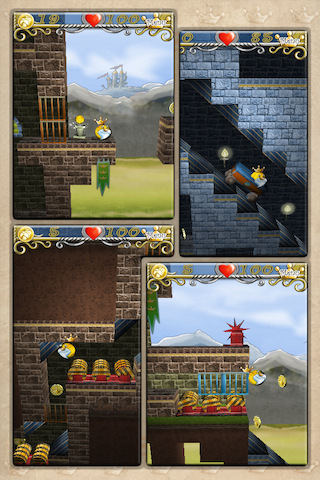 Sample the free version of King Rupert on your iPhone. AppSafari review of King Rupert was written by Vanessa Paszterko on January 18th, 2011 and categorized under Action, Adventure, App Store, Fun, Games, Platformer. Page viewed 3240 times, 1 so far today. Need help on using these apps? Please read the Help Page.